The Innovation Award sponsored by Lectra UK, was introduced in the 2013-14 academic year, and is open to students at member universities and colleges on any course involving clothing and textiles, which includes a major project other than a traditional dissertation. Projects may have a creative, technical or business focus, but should demonstrate in-depth research into innovation within the industry. Submissions are entered in June and the winner and runners up are announced at the student conference in November. 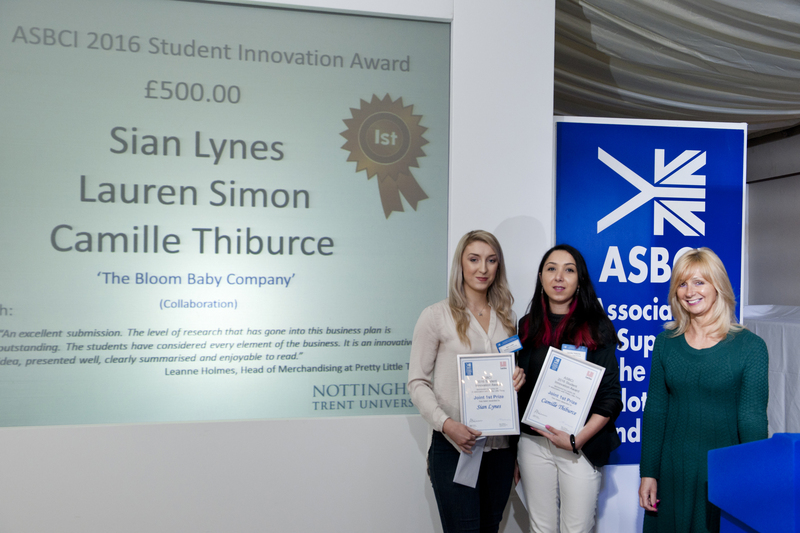 The joint winners for 2016 were Sian Lynes, Lauren Simon and Camille Thiburce graduates from Nottingham Trent University with their paper entitled, "The Bloom Baby Company." Pictured above from l-r, Sian Lynes, Camille Thiburce and Mary Wilcock, Financial Controller at Lectra UK. Cash prizes of £500, £300 and £100 were awarded for first place, first runner up and joint second runner up. 2016 Joint 1st Prize: Sian Lynes, Lauren Simon and Camille Thiburce from Nottingham Trent University. Runners up: Jessica Vrsalovich from De Montfort University, Yumen He and Ruwen Song from London College of Fashion. 2015 1st Prize: Emma Dane, University of Manchester. Runners up: Zoe Robinson, University of Huddersfield and Chia Nieto, University of Leeds. 2014 1st Prize: Carina Harrison, University of Huddersfield. Runners up: Hannah Miller, De Montfort University; Alexandra Powell and Hannah Smith from Birmingham City University.